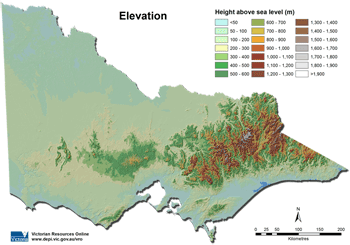 A broad scale map of Victoria’s relief is available here in the form of a Digital Elevation Model (DEM). The following map is a representation of Victoria’s elevation. It highlights the variety of landforms evident across the State and encompasses the total elevation range, from the highest point at Mt. Bogong (1986 m) to sea level along the Victorian coastline. The dominant feature is the Great Dividing Range. This was formed from the uplifting of the earth's crust. The Great Dividing Range runs from western Victoria (Grampians) to eastern Victoria (Eastern Uplands and Australian Alps) and continues parallel to the eastern seaboard through New South Wales to northern Queensland. This DEM derived map of Victorian elevation is from spot heights taken from 1:100,000 map sheets, using a 500 metre grid cell. The State is divided into various categories of relief, with a greater number of categories at lower elevations in order to enhance subdued landscape features. The relative elevation of landscape features can provide a consistent model for landform description, as this factor will have a major effect on landscape behaviour ie. differing erosional potentials due to gravity (Vis mountains verses plains). The classification defined in the table below, has been used to provide consistency in relating landscape dimensions with general concepts of landform ie. When does a hill become a mountain? This classification system is strictly morphological and indicates the amplitude of the landscape. However, definitional issues arise in determining the measuring points (ie. Where is the bottom of the hill or mountain defined?) The combination of slope classes with relative elevation provides an extra dimension or shape to the morphology description - eg. flat, gently undulating or undulating plains (see McDonald et al, 1990, Ed 2, p36).